RALEIGH, N.C. — The Herd couldn’t finish what they started. 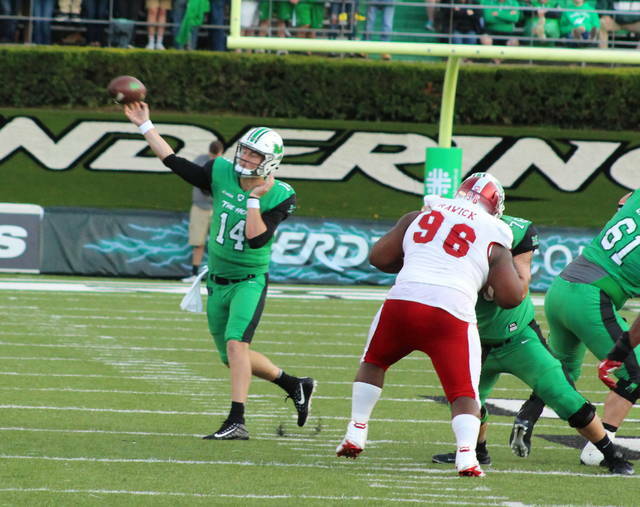 The Marshall University football team built a 20-10 lead late in the second quarter, but host North Carolina State responded with 27 unanswered points en route to a 37-20 victory Saturday in a non-conference contest at Carter-Finley Stadium. The Wolfpack (1-1) picked up its first win of the season by going on the defensive as the Red and White held the Thundering Herd (1-1) scoreless over the final 35 minutes of regulation. Down by 10 with 5:07 remaining in the second period, NCSU quarterback Ryan Finley threw touchdown passes to Jaylen Samuels and Kelvin Harmon just before the break — giving the Wolfpack a permanent lead of 23-20 headed into halftime. Reggie Gallaspy added a 1-yard touchdown run in the third quarter and capped the scoring with a 23-yard gallop in the fourth, allowing the hosts to wrap up the come-from-behind 17-point triumph. Both teams accumulated more than 450 yards of total offense, but Marshall had nine of the 12 penalties in the contest and also committed both turnovers in the setback. Complete details of Marshall’s road opener will be available in the Tuesday sports edition of the Point Pleasant Register. Marshall quarterback Chase Litton (14) releases a pass attempt during the second quarter of a Sept. 2 non-conference football contest against Miami (OH) at Joan C. Edwards Stadium in Huntington, W.Va.